Jeff Jacobsen: "Medical Claims Within Scientology's Secret Teachings"
L. Ron Hubbard, a science fiction writer, published Dianetics: the Modern Science of Mental Health, in 1950. Dianetics is a theory of the mind in which an "auditor" guides a "preclear" through isolated past incidents in the preclear's life and "runs" the memory called an "engram" until it clears up within the preclear's mind. This process called "auditing" is done with an "e-meter", a crude galvanic skin response meter that supposedly helps find and "run" problematic memories. Note that this is a precise physical process supposedly discovered and scientifically tested by Hubbard. It is not a religious appeal to spiritual help. Auditing was and is touted as a secular scientifically proven method of handling mental and physical ills. In 1953 Hubbard founded the Church of Scientology. Scientology is advertised as a religion, and has even obtained tax exempt status in the United States, though under mysterious circumstances. more Scientology uses the same auditing process and the same e-meter as Dianetics. Hubbard taught in Dianetics theory that an "awareness of awareness unit" was the basic entity of a human being. This is called "the individual himself" in Dianetics or the "thetan" in Scientology. It was by "very scientific, unquestionable means" (Ability magazine, Minor 5, "The Hope of Man") that Hubbard discovered the awareness of awareness unit, and "You and I or any scientist here in Washington government... would have come to the same conclusions" (ibid.). Thus, Dianetic auditing and Scientology auditing both audit the same entity and utilize the same process with the same e-meter, the main difference being that Scientology auditing requires highly trained auditors. Scientology teachings have been jealously guarded by the church and only those who have completed Dianetics auditing and come up to the training level of "clear" are allowed to take the secret "OT" and "NOTs" courses that finally allow Scientologists to find out what their church teaches. The secrecy of these documents and teachings have been shattered in recent times, however. OT level 3, probably the most important of the course levels, was revealed in 1985 in a court case between an ex-Scientologist, Lawrence Wollersheim, and the church. Wollersheim sued claiming that the church harmed him psychologically and won his case. In 1991 the church sued Steven Fishman over his statements published in a Time magazine cover article about the dangers of Scientology (US District Court, Central District of California, case number CV 91 6426 HLH). Fishman placed the OT levels as exhibits in his case, and these were publicly available for several months. 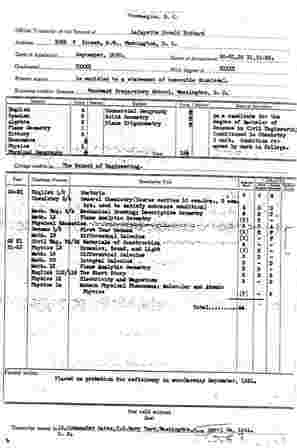 On Christmas Eve of 1994 an anonymous person posted the OT levels to the internet newsgroup alt.religion.scientology. Since then, the OT courses have been almost regularly available either on alt.religion.scientology or on a web page somewhere. Later the NOTs courses (newer related courses to OT) were posted, and as of this writing (September 1996) they have been posted 6 times. Although the church claims that these courses are "trade secrets" and are expertly guarded, they are nevertheless at this time widely and easily available to the public. "I've seen a goiter the size of a baseball visibly shrink and disappear in the space of one-half hour right after an engram was run." "A girl crippled by polio was able to throw away her crutches after my first session." "Today, Eleanor has arthritis. She is audited... tonight she doesn't have arthritis"
"A broken limb will heal (by X-ray evidence) in two instead of six weeks." "ONLY processing by Dianetics and Scientology can handle the effects of drugs fully." "A child had died, was dead, had been pronounced dead by a doctor, and the auditor, by calling the thetan back and ordering him to take over the body again brought the child to life." Cure migraines DIANETICS (1975 ED.) P.125 also see HCOB 15 Jan. '79 "Handling with Auditing"
"Cancer has been eradicated by auditing out conception and mitosis." "Scientology is the only specific (cure) for radiation (atomic bomb) burns." Improve eyesight PAB no. 111 "Eyesight and glasses" also Dianetic Auditor's Bulletin vol. 2 no. 7 January 1952 "An afternoon with Ron"
"You are only three or four hours from taking your glasses off for keeps." Cure a broken ankle HCOB 30 July 1973 "Scientology, Current State of the Subject and Materials." Cure insanity HCOB 28 Nov. '70 "Psychosis"
"The alleviation of the condition of insanity has also been accomplished now..."
Cure bronchitis HCOB 14 Dec. '63 "Case analysis Health Research"
"12 days after this auditing the coughing was still in abeyance." Cure brainwashing HCOB No. 19 Dec. '55 "The turn of the Tide"
"... in Dianetics in particular, we have the total antidote for the eradication of brainwashing." "arthritis vanishes, myopia gets better, heart illness decreases, asthma disappears, stomachs function properly and the whole catalogue of illnesses goes away and stays away." "The GE has the record of past deaths. Auditing it alters physical structure, eradicates physical malformations." "Paralysis, anxiety stomachs, arthritis and many ills and aberrations have been relieved by auditing them." Hubbard wrote that Scientologists taking courses were barred from visiting a doctor without express permission from the church "except in cases of severe emergency." (HCOPL 26 July 1965 "Release Declaration Restrictions, Healing Amendments"). One must assume that the church did not really want sick people taking courses, and thus one could infer that it was assumed that auditing could handle any illness of the student. "The device should bear a prominent, clearly visible notice warning that any person using it for auditing or counseling of any kind is forbidden by law to represent that there is any medical or scientific basis for believing or asserting that the device is useful in the diagnosis, treatment, or prevention of any disease. It should be noted in the warning that the device has been condemned by a United States District court for misrepresentation and misbranding under the Food and Drug laws, that use is permitted only as part of religious activity, and that the E-meter is not medically or scientifically capable of improving the health or bodily functions of anyone. "Each user, purchaser, and distributee of the E-meter shall sign a written statement that he has read such a warning and understands its contents and such statements shall be preserved." Obviously, the church was supposed to stop promoting their auditing process with the e-meter as having medical value. And it was assumed by the outside world that the church was at least minimally abiding by the agreement with the FDA, though it continues to sell the works that contain the previously quoted medical claims. When the NOTs courses were posted on the internet, some who read it perceived that portions of the series seemed to be stating that auditing could cure illnesses. Since these courses were not available to the public or even the FDA, no one had been able to observe any possible medical claim except Scientologists in good standing who had completed a long list of courses and reached the particular level of "clear." H. Keith Henson, upon reading NOTs, was certain enough about one of the series, #34, that he posted it in its entirety to the internet newsgroup alt.religion.scientology, stating that he was exposing medical fraud. He did this despite Scientology's well-known record for suing and harassing critics. The church promptly sued him (U.S. District Court, Northern District of California, case number C-96-20271RMW). I have reviewed the NOTs material posted to the internet and assume that it is the real thing, because 1) the church legally went after those who posted the NOTs for copyright violations, 2) former members vouched for the authenticity of the material, and 3) it is consistent with other church writings. Being a Clear but not having completed OT levels "doesn't necessarily effect the person himself, but it does effect the body — severely." Series 2 seeks to motivate Scientologists to take the next courses by stating that "Clears should be told they are at risk until OTIII" of "illness, possibly worse." This series deals with mis-auditing problems. NOTs mis-auditing can hurt the physical body "dangerously so" by stirring up dormant BTs. A cluster of BTs can shut off nerve channels which can cause deafness or blindness - "when a cluster suddenly mocks up mass, it shuts off nerve channels." Extrapolating from this, one could imagine many other illnesses caused by such a phenomenon, such as blockage of the urinary tract. BTs and clusters can effect a person's perception. BTs are acting as various illnesses. Once audited away the illness supposedly is gone. "BTs or clusters being 'negative'... probably are the root of sickness." "You can run into a cluster causing damage to the body." "Clears should be told they are at risk (of illness) until OTIII." "If a guy has a bad secondary, or a bad injury, you handle that with Date/Locate [an auditing procedure using the e-meter]." "If ill or injured handle [w]ith an Assist (NOTs 3)"
"Body distortions" are cleared up. "If the person is sick as well as being subjected to a dangerous environment, there would be no hope of recovery without auditing." "This cluster... was the underlying cause of the stomach pain and the stomach condition." "...a full recovery to health was accomplished." "Most people are sick due to some out-rudiment scene." "He started recovering physically. Articulation handled and walking improved." "This case was... considered incurable by the medicos." I have not elaborated on these quotes too much because they would require an introductory course into Scientology teachings to understand. Suffice it to say that these representative quoted portions are written in clear enough english to understand and comprehend. The church's current magazines also contain glowing testimonials of miraculous healings by using Dianetics techniques. Issue 65 of Centre Magazine (an SMI publication) copyrighted 1995 has a claim that a man was healed of cancer through Dianetics processes. In the island of Mauritius, Scientologist Maria Slender started teaching Hubbard healing theories. A man named Krishna Gopaloodoo decided to use Touch Assist and Nerve Assist techniques on his soccer team members; "I learned... so that I could cure the injuries of my players." Krishna's father had lung cancer and the doctors said "his days were numbered." Krishna used the Hubbard healing methods on his father, and he got dramatic results. The father was xrayed again and "the latest X-Ray showed a marked improvement in my father's condition." The cancer "started to clear." On the church's internet web page are many testimonials, some of which are about physical healing. For instance, "J.M." explains his/her "chronic vascular disease" was described as most likely permanent by specialists. After a week of auditing "all physical evidence of the condition was gone. It is 1 1/2 years later and the disease has not returned." These healings were supposed to be the result of a precise, scientifically proven process invented by L. Ron Hubbard using the e-meter patented to Hubbard. All of the writings of Hubbard quoted above are still published and sold by Scientology. Auditing is scientific. Auditing heals. Auditing is a healing science. And auditing requires the use of the E-meter. It appears obvious that externally the church seemed to comply with the FDA agreement while to insiders it was unabashedly stating that auditing cures physical ailments. Apparently the church felt safe behind its wall of secrecy. 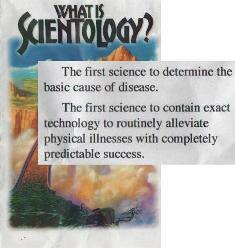 How many Scientologists there have been who relied on the validity of these medical claims is unknown. In one case, Roxanne Friend v. Church of Scientology International, et al., "The Church settled this case for nuisance value" (IRS form 1023 documents submitted by the Church of Scientology). Friend "claimed the Church was responsible for her cancer not being earlier detected by not allowing her to see a doctor" (ibid). Roxanne Friend died of this cancer. Perhaps Ray Mithoff or some other high ranking Scientologist could fill in any history of failed handlings of medical conditions with Scientology healing processes. The Church of Scientology will no doubt attempt to fall back on its religious status and claim that these are spiritual healings and are thus exempt from FDA or any other secular medical rules and laws. However, the church's own writings destroy this defense. "L. Ron Hubbard, one of America's first nuclear physicists, ..." [inside jacket of All About Radiation]. "I was a Ph.D., Sequoia's University and therefore a perfectly valid doctor under the laws of the State of California." [HCOPL 14 Feb. 1966 "Doctor Title Abolished"]. Sequoia University was a diploma mill where anyone for a small fee could obtain a diploma. In Professional Auditor's Bulletin #82, "Scientology, Translator's Edition" 1 May, 1956, by "L. Ron Hubbard, Ph.D. C.E." we have the statement that Scientology "was organized by L. Ron Hubbard, an American, who has many degrees" (Tech. Bulletins, vol. 2, p.406). Hubbard stated "That was the first and only time the government offered me a post as a nuclear physicist." (L. Ron Hubbard Creating A New Civilization Tape Series Tape A Postulate Out Of A Golden Age December 6 1956). Hubbard also stated "I happen to be a nuclear physicist; I am not a psychologist nor a psychiatrist nor a medical doctor" ("Dianetics: The Modern Miracle". February 6, 1952). Obviously, Hubbard was puffing his academic background toward the scientific end. He wanted people to see him as a master of the physical sciences. Hubbard claimed that his auditing process was scientifically valid. L. Ron Hubbard constantly makes the claim that dianetics is a "scientific fact." In fact, he makes that claim 35 times in Dianetics: The Modern Science of Mental Health. For example, "All our facts are functional and these facts are scientific facts, supported wholly and completely by laboratory evidence." (DIANETICS, (1987 edition) p. 96). Hubbard shows that he regards correct scientific experimentation to a high degree by carefully hedging his approval of another scientific experiment done by someone else. This test was conducted in a hospital to see whether unattended children became sick more often than attended children. "The test... seems to have been conducted with proper controls," (DIANETICS, p.143) he cautiously states, not having apparently seen the entire written report. In the Scientology book All About Radiation is the statement that "Scientology has been called that branch of atomic science which deals with human ability" (p. 46, 1979 edition). Hubbard wrote that "Scientology is... more exact than what are called the physical sciences" (Scientology 8-8008 p. 13). "Scientology is the only workable system man has" (Introduction to Scientology Ethics, p.64 1976 reprint). Scientology "is, indeed, the most validated science of mind Earth has ever known" (Journal of Scientology Issue 40-G, "Validation of Scientology"). "It is carefully observed here that the science of Scientology does not intrude into the Dynamic of the Supreme Being" (Professional Auditor's Bulletin No. 83). "Dianetics is a science; as such, it has no opinion about religion, for sciences are based on natural laws, not on opinions" (Dianetics Auditor's Bulletin Vol. 1 No. 4, October 1950). "Scientology, which includes Dianetics, is a workable system. The route is taped. The search is done. Now the route only needs to be walked" (Dianetics Today p.951). With all of the above, then, how can the church possibly claim that its healing claims are religious? Dianetics was developed in 1950. The Church of Scientology was created in 1953. There is evidence from Hubbard's own writings that this "religion angle" was a business move rather than an actual move into the religious world. In 1962 Hubbard wrote "Scientology 1970 is being planned on a religious organization basis throughout the world. This will not upset in any way the usual activities of any organization. It is entirely a matter for accountants and solicitors" (HCOPL 29 October 1962 "Religion"). When Hubbard's healing claims began receiving scrutiny by governments and others, Hubbard apparently saw the need to distance his claims away from the secular to the religious. In United States v. Article or Device, etc.) the court stated "The bulk of the material is replete with falsehood medical and scientific claims devoid of any religious overlay or reference." Such attacks were concern for the church. Hubbard began to write of his concern that the church should appear religious; "promotion of the practice of Dianetics as a treatment for the sick or afflicted... by other than medical doctors, will violate the medical practice laws where they exist and lead to trouble" (HCOPL 3 June 1969, "Legal Statement Concerning Dianetics and Medical Practice Laws"). Hubbard began to teach how to make Scientology appear religious; "Visual evidences that Scientology is a religion are mandatory on the PES... Stationary is to reflect the fact that orgs are churches..." (HCOPL of 12 February 1969, "Religion"). Today Scientology operates by selling different courses and levels of training for very high, fixed rates. It claims that its upper, secret levels of training are trade (and thus, business) secrets. Its promotional mailings, TV commercials and other methods of recruiting stress the secular aspects of Dianetics and keep the religious angle in the fine print. So which is it? Is auditing a religious practice or a scientific process? From researching this question, I believe that auditing is sold as a scientific process that is also used to handle spiritual problems (the eradication of body thetans, or leech-like souls attached to ours). Those who join the church must first become a "clear" by taking Dianetics courses. Dianetics has NEVER to my knowledge been touted by Hubbard as a religion. Dianetics is "The Modern Science of Mental Health" as the title of Dianetics shows. Scientology on the other hand deals with the soul, so it could be considered religious. However, the Church has chosen to treat Dianetics and Scientology as inseperable siamese twins, and in fact Dianetics is under the tax exemption of the Church of Scientology, as I understand the church's religious tax exemption. So, there seems to be a split personality within Scientology; is it a religion that deals with spiritual aspects only? Or is it a science that offers physical cures? Can the Church of Scientology legally continue to promote auditing as a medical panacea? The FDA apparently thought it had put this question to rest, but it looks like they've never seen the NOTs writings that are being sold at present and in fact have been for years. H. Keith Henson's case is now going through the courts, where his defense of his alleged copyright violations will be that he was exposing medical fraud. The FDA should review its case against the church in light of the NOTs material. Potential Scientologists should be made aware of the amazing medical claims made by the church so they can evaluate its validity. And all of us should be cautious when dealing with an organization that won't let you know what they teach until you hand over thousands of dollars. Further reading: Scientology: practicing medicine without a license?